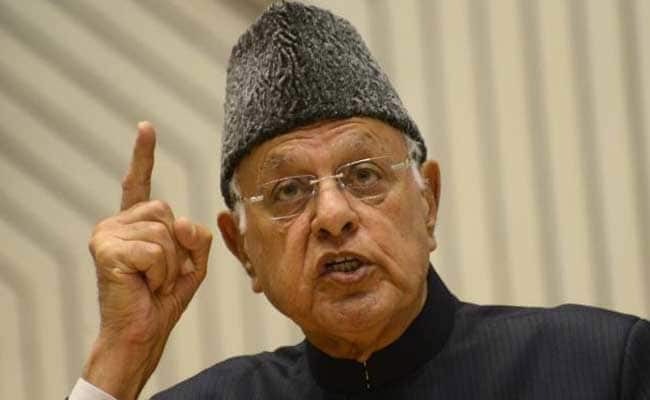 Alluding to the Peoples Democratic Party (PDP) and People's Conference (PC), Farooq Abdullah said the BJP was using its "cronies" to weaken the special status of Jammu and Kashmir. Farooq Abdullah said the BJP manifesto reflects the BJP's hatred for the identity of the state. "PM Modi and Shah are the biggest enemies of people who believe in dividing the nation on basis of caste, creed and religion. But the people have made it a point not to fall prey to the divisive agenda of the BJP," Mr Abdullah said. The National Conference patriarch accused BJP of trying to divert people's attention by propping up emotive issues. "These people want to change the very framework of the Constitution of India, which grants equal rights and opportunities to everyone. It is the Constitution of India which grants rights to profess any faith. It is the same Constitution that confers upon our state certain constitutional safeguards," Mr Abdullah said. "It is the same Constitution which grants our state a special status by means of Article 35 A and Article 370. These people have always shown abhorrence for our special status and special constitutional position," he added. Mr Abdullah said the BJP manifesto reflects the BJP's hatred for the identity of the state. "They have forcefully vowed to do away with the provisions of Article 370, Article 35 A in that manifesto. Their sole agenda is to change the demography of our state. However, let me tell them that they are playing with fire," he said. Alluding to the Peoples Democratic Party (PDP) and People's Conference (PC), Mr Abdullah said the BJP was using its "cronies" to weaken the special status of Jammu and Kashmir. "To meet this purpose, they have employed various henchmen in our state, such cronies can be seen holding inkpot (PDP's party symbol) and apple (PC''s party symbol) in their hands. The sole aim of BJP and its cronies is to make non-state subjects buy land and property in our state," he said. "Our fight is with the divisive forces. We should utilise our power of vote to show such forces as are inimical to our special status their right place. They can go to any extent to grind their axe, they will use men, money and machinery to coerce the voters," Mr Abdullah said. "However, the need of the hour demands us to remain united and vigilant of their machinations. This time we are voting for our identity and the integrity of our state," he said. Mr Abdullah said the National Conference would not allow anybody to fiddle with the state''s special status. "We have been (protecting) and will continue to protect the identity, integrity and pluralistic character of our state. We would not allow anyone to abridge our rights," he said.